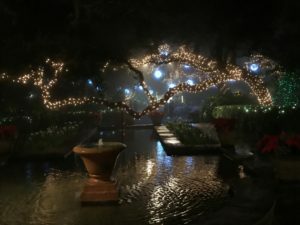 Bellingrath Gardens and Home is celebrating the 23rd year of Magic Christmas in Lights in 2018! 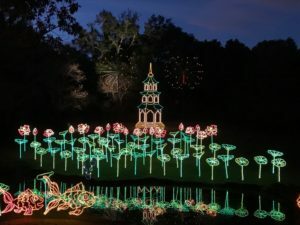 In this Gulf Coast holiday tradition, guests stroll through a dazzling light display that features more than 1,100 set pieces, 3 million lights and 15 scenes throughout the 65-acre Garden estate. In addition, the Bellingrath Home is decorated in its holiday finery and enhanced with beautiful poinsettias. Magic Christmas in Lights opens on November 23 and continues nightly, rain or shine, through December 31, 2018 (closed Christmas Day). Magic Christmas in Lights is open each night from 5 to 9 PM. Tours of the Bellingrath Home are every hour and half hour until 8:30 PM. Magic Christmas in Lights includes nightly choral performances on the South Terrace of the Home on Sundays through Thursdays. In addition, guests may purchase hot chocolate on Live Oak Plaza to warm the heart and soul. Magic Christmas in Lights is a family-friendly event for all ages to get everyone into the holiday spirit. 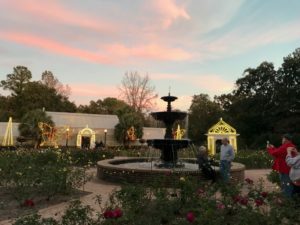 After touring the lights, guests will want to have photos taken with Santa and find that perfect holiday present in the popular Bellingrath Gift Shop. Special group rates are available for Magic Christmas in Lights. Call 251.459.8986 for information and rates. Military Mondays are back! Each Monday of Magic Christmas in Lights, military personnel and their immediate families are eligible for a 15% admissions discount on Gardens-only tickets. The dates are Nov. 26 and Dec. 3, 10, 17, 24 and 31. Please note: Tickets purchased online are good for any night of Magic Christmas in Lights throughout the 2018 season. The Magnolia Room in the Magnolia Café is available for parties for the first few weeks of the season. The rental fee is $500. To book your holiday party, call Sally Ericson at 251-459-8973. The Magnolia Café will be open for evening meals every night from 4 to 8 PM during Magic Christmas in Lights. All meals include soup or salad, dessert, and tea or coffee. Magic Christmas in Lights includes weeknight concerts featuring local choral groups. Here is the schedule. Monday, November 26, 6:00 PM Bayside Academy's Down the Bay Singers, Daphne, Ala.
Monday, November 26, 6:30 PM Azalea City Harmony Chorus, Mobile, Ala.
Tuesday, November 27, 7:00 PM Port City Tuba-Euphonium Ensemble, Mobile, Ala.
Wednesday, November 28, 5:30 PM Clark-Shaw Magnet School Jazz Band, Mobile, Ala.
Thursday, November 29, 5:30 PM Alma Bryant High School, Irvington, Ala.
Sunday, December 2, 5:30 PM Faith Academy Chamber Singers, Mobile, Ala.
Sunday, December 2, 6:00 PM Excel Baptist Church Choir, Mobile, Ala.
Sunday, December 2, 6:30 PM Salvation Army Band and Choir, Mobile, Ala.
Monday, December 3, 6:00 PM Fairhope Middle and High School Choruses, Fairhope, Ala.
Tuesday, December 4, 5:30 PM B.C. Rain High School's Rain Chorale, Mobile, Ala.
Tuesday, December 4, 6:30 PM Satsuma High School Jazz Band and Choir, Satsuma, Ala.
Wednesday, December 5, 6:30 PM Mary G. Montgomery High School, Semmes, Ala.
Wednesday, December 5, 7:00 PM Gulf Coast Community Trombone Choir, Mobile, Ala.
Thursday, December 6, 6:00 PM Citronelle Memorial Baptist Church Christmas Choirs, Citronelle, Ala.
Thursday, December 6, 6:30 PM The Austin Singers, Mary B. Austin Elementary School, Mobile, Ala.
Thursday, December 6, 7:00 PM Faith Academy Jazz Band, Mobile, Ala.
Sunday, December 9, 5:30 PM Saraland Singers, Saraland High School, Saraland, Ala.
Sunday, December 9, 6:00 PM St. Luke's Episcopal Upper School Chorus, Mobile, Ala.
Monday, December 10, 5:30 PM Baker's Dozen and Belles of Baker Choruses, Baker High School, Mobile, Ala.
Monday, December 10, 7:00 PM Pride of Mobile Men's Chorus, Mobile, Ala.
Monday, December 10, 7:30 PM Causey Middle School Choir, Mobile, Ala.
Tuesday, December 11, 5:30 PM Mobile Symphony Orchestra Education Program's String Academy Ensemble, Mobile, Ala.
Tuesday, December 11, 6:00 PM UMS-Wright Lower School Chorus, Mobile, Ala.
Tuesday, December 11, 6:30 PM UMS-Wright Upper School Chorus, Mobile, Ala.
Tuesday, December 11, 7:00 PM Davidson High School Warrior Sound, Mobile, Ala.
Wednesday, December 12, 5:30 PM Voices of Williamson Chorus, Williamson High School, Mobile, Ala.
Wednesday, December 12, 6:00 PM Alabama School of Math and Science Chorus, Mobile, Ala.
Thursday, December 13, 6:00 PM Bishop State Community College Chorus, Mobile, Ala.
Thursday, December 13, 7:00 PM St. Martin High School Choir, Ocean Springs, Miss.